Direct Sportslink secured football legend Anthony Munoz as the keynote guest motivational speaker for LSI's national sales conference. Anthony was the perfect speaker for this event, being a Cincinnati sports legend who is so involved in the community. His speech covers topics such as accountability, leadership character traits, what it takes to build a winning team and his personal life story that resonated well with this audience. After his speaking engagement, Anthony signed mini footballs branded with the company name and took photos with each guests. To secure Anthony Munoz for a motivational speaking engagement, personal appearance or endorsement please contact a Direct Sportslink booking agent for immediate fee quote and availability. An Anthony Munoz personal appearance, Anthony Munoz speaking engagement, or Anthony Munoz endorsement will reflect well on your company. To hire Anthony Munoz now for any corporate appearance, fundraiser, motivational speaker event, personal appearance, autograph signing, or website endorsement please contact our celebrity agents at 1-877-6-SPORTS. We will contact Anthony Munoz or contact Anthony Munoz's agent and provide you with the booking fees and availability immediately upon your request. Direct Sportslink is the only sports speakers bureau and talent booking agency based in the United States securing only sports talent for corporations, associations, and organizations for motivational speaking engagements, personal appearances, and endorsements. We are the premier sports celebrity booking agency and a sports celebrity procurement expert. Accordingly, we will provide you with any relevant Anthony Munoz website information and booking agent details so that you can hire Anthony Munoz for your next event. 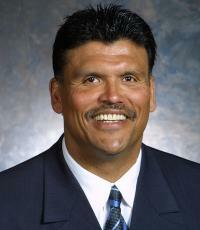 Anthony Muñoz is a former offensive tackle for the National Football League's Cincinnati Bengals. 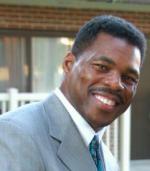 He earned a scholarship to USC and was selected by the Bengals in the first round of the 1980 NFL draft. At 6'-6" and 280 pounds, Muñoz was extremely agile and excelled at both pass-blocking and run-blocking. His blocking was a big reason for the Bengals emergence as an elite team in the 1980's, and assisted them to 2 Super Bowl appearances; Super Bowl XVI and Super Bowl XXIII. Considered by many peers and fans alike to be one of the finest offensive tackles ever, Anthony Muñoz was a perennial Pro Bowl selection, a three-time Offensive Lineman of the Year (1981, 1987, and 1988), and was named to the team 11 consecutive times. In 1994, Muñoz was named to the National Football League's 75th anniversary all-time team. In 1998, Anthony Muñoz was enshrined in the Pro Football Hall of Fame. Shortly after receiving the honor, Muñoz's hometown of Ontario renamed its Colony Park "Anthony Muñoz Hall of Fame Park". The renaming ceremony was held on June 26, 1998, and was attended by Muñoz, his family, and city officials, and Ontario residents. The park, incidentally, is the place where Muñoz met his wife DeDe after a pickup softball game during his youth. Anthony Muñoz continues to work in the community while also making personal appearances and speaking engagements on behalf of corporations. 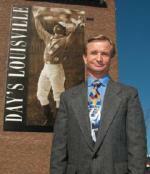 He has also endorsed a furniture store in Cincinnati. Based on your interest in Anthony Munoz as a speaker or for a personal appearance, Direct Sportslink has provided you additional links below for other sports talent with similar appearance fees, speaker topics, and categories that match Anthony Munoz.